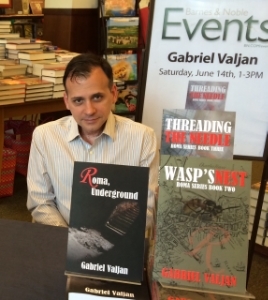 Biographical information on writer Gabriel Valjan, author of the Roma series published by Winter Goose Publishing. “About Me” is really the question “Who Are You?” in disguise. It is like the riddle of identity that begins on the road with Oedipus and emerges from the labyrinth as if we are a character in a Borges story. Aren’t we all characters in a story that writes itself? No clever wordplay intended here, but think about it: Isn’t the answer to “About Me” almost always the résumé, a life-story all worked out, in linear form, rational and reasonable as the arc of a good story? My path, just like yours if you were to think about it, has been forked, been sinuous, a process of unexpected arrivals and discoveries, of becoming Other than what I thought of myself in the beginning. Sure, I could assert an order, find patterns, and interpret events, as if everything leads me to the present moment. There are some indisputable facts: I was born forty-odd years ago in an industrial town on the east coast of the United States; attended a prestigious high school, where I received a rigorous education at the hands of extraordinary teachers; and then went to college in southern California and later, graduate school in northern England; worked various jobs in various industries. I wasn’t a very good student until about the seventh grade. I hated math, loved Art, and what my elementary school called Language Arts. I was the odd kid out because I had transferred into the school in the third grade. Second smallest kid in the class, which meant I was near the head of the line when classes changed and when we queued up in the mornings and late afternoons. I was also very quiet; in fact, most of my classmates thought I was stuck up, when in fact I was shy because I was hearing-impaired. I had lost most of my hearing due to an antibiotic given to me when I was an infant. The loss itself was not discovered until I was five or six years old. I wear bilateral hearing aids and, fortunately, do not have any speech pathologies, which is miraculous given my hearing loss. In high school, I was an excellent student. I still hated math until this very weird thing happened to me in my senior year: calculus fascinated me because philosophy and the language of numbers merged. While I had good grades in science, I struggled with it, spent more time on it than my other subjects. Literature classes were an easy ‘A.’ Latin was work, but fun. It’s also a language people don’t speak. I mention all of this because at college I majored in science, avoiding English because I considered it an easy walk. I would earn mediocre grades in the sciences. One semester I took a break from the sciences and registered for two literature-survey classes. One the one hand – and I’m being honest here – I wasn’t altogether challenged because I had read almost all the authors my college had in the curriculum for the English and American Literature major, but on the other hand, I was reacquainted with old friends from my town library again, and I saw things that I hadn’t noticed before when I had first read them. Life moved on and I graduated. Just as everyone else, I tried to figure where I fit in the work-world, tried to swim against the riptide of responsibilities, debt, and other things we call Life. I had decided not to study medicine. Instead, I thought about this thing called ‘Literature’ and what I could do with it. Most of the post-modernist stuff didn’t speak to me, but since I enjoyed Latin, I considered medieval literature, which I had some knowledge of, but little depth of understanding. I completed my dissertation abroad in Medieval Studies and stood at the crossroads: stay in England or return to the States, pursue the doctorate or not. I chose not to go for the Ph.D, for a variety of reasons. I went back to work-world. I would travel a lot in the subsequent years: more of England; bits of France; a little of Germany; a lot of Italy; fast trips, like raids, into Canada; a foray into Scotland; and a dash of Yugoslavia. I worked long, long hours. I paid off all those student loans. I took engineering classes because my company paid for them. I became interested in fitness, addicted to the endorphins from long runs, mountain-biking, and triathlons. I stepped up my interests in competitive sports and became a certified personal trainer, a yoga instructor, and an advanced SCUBA diver. By this time, I had a mosaic for a CV: time in various administrative jobs before I had settled into a nice stretch for a few years as an application engineer at a multinational company. Then the floor dropped out in a bust economy. I reinvented myself and became an RN, a registered nurse. My clinical experience has ranged from pediatrics to oncology, literally cradle to grave, from the uplifting and majestic to the tragic and disturbing. Nothing I can say without sounding like a cliché can summarize that part of my life. I continued to read, yes, but this time I was reading authors in other languages. I didn’t read to avoid people anymore, but to understand others and myself. My library expanded and contracted, offered me wide vistas and, occasionally, some narrow passageways. Then I thought, What about writing? As Whitman wrote (and, unfortunately, a car commercial quotes), “the powerful play goes on, and you may contribute a verse.” I wondered what my contribution would be, and in what form. I had written some poetry, even had a poem published before I left college; but I had never given serious thought to pen and paper, or keyboard. I didn’t think I had ‘the gift,’ or anything important to say about anything. In 2007 I wrote my first novel and rewrote it seven more times. In 2009 I indentured myself for a year to write nothing but short stories, about one a week. In 2010, two of my short stories were published: one of them was shortlisted for the Fish Prize, a prestigious literary prize in Ireland. One of my stories that year -- inspired by a challenge from a coworker who teased me that men can’t write women – became the genesis of The Roma Series. Winter Goose Publishing had accepted Roma, Underground while I was undergoing treatment for a life-threatening illness. I wrote to keep both my sanity and my spirit afloat. One of my best friends, who had helped me swim back to the land of the living, died unexpectedly. My physical fitness may have saved my life, but I had never expected that blow. I was devastated and unmoored. I edited the Roma galleys as I fought off depression by writing the sequel, Wasp’s Nest. As I write this, five novels constitute The Roma Series. Book 4 is out in early 2015. I have written seven other novels that are in need of a home and readers. A handful of my short stories have been published. I hope to be heard as I bob up and down in the vast sea of writers out there. What are the interpretations that I can impose on these bald, skeletal facts? I embraced science because it was a challenge, and abandoned it, only to return to it later. I read to avoid Life, then to understand it. My hearing drove me to passive observation of others and then gave me an active understanding of the lives around me. I have held my own breath as I witnessed the first breaths of the living and last breaths of the dying. I find my answer in "The Garden of Forking Paths", a story by Jorge Luis Borges. Every decision I have made has played out so that I could be the author of my identity, the author of my own process of becoming. Who are you? My answer to the question is that I have been my own friend and my own enemy. I have walked paths that I thought were a way out, but that led me into necessary perplexity. I have been both Theseus, aided by friendship’s thread, and the Minotaur of my own device. I hadn’t planned the journey but I wrote myself out of the Labyrinth into existence. I am a writer. Writing Assistant #1 - "Mr. Squeak" - is an expert on authentic dialog and enemy of purple prose. He petitions per union contract periodic breaks for petting. His other duties include Door Greeter and Seeker of Closets. Writing Assistant #2- "Mr. Squawk" - keeps the writer humble with occasional swats. His yowls remind the writer of the many ways that language can be interpreted - feed me, pet me, and go away.